When a brand introduces a whole new collection, press presentations usually focus on the new addition to the family. So when Cartier introduced the Drive de Cartier, I did not expect to find a new addition to the Ballon Bleu family in one of the brand’s signature red and gold boxes. Especially not a Ballon Bleu with moon phase. In Cartier’s rich history, the moon phase has been largely and conspicuously absent. Why? That is a question easier to ask than to answer. In the early days, when the brand joined forces with LeCoultre to supply many of its movements, it would have been relatively easy to obtain a movement with this complication. That said, Cartier wouldn’t have had problems obtaining any complication for its watches, yet as complicated as its manufacture clocks were, the brand always kept its watches simple, elegant, and uncluttered. Refined details and dials did the talking, wrapped in timeless, shaped cases. That does not mean that Cartier has always fully refrained from using the moon phase. The Santos, Tank Americaine, and Louis Cartier Tank all have featured models with moon phase and date hand indications, yet these are among the very few that Cartier made where the moon printed on a disk travels across a cutaway, the most traditional haute horlogerie way to display the moon phase. 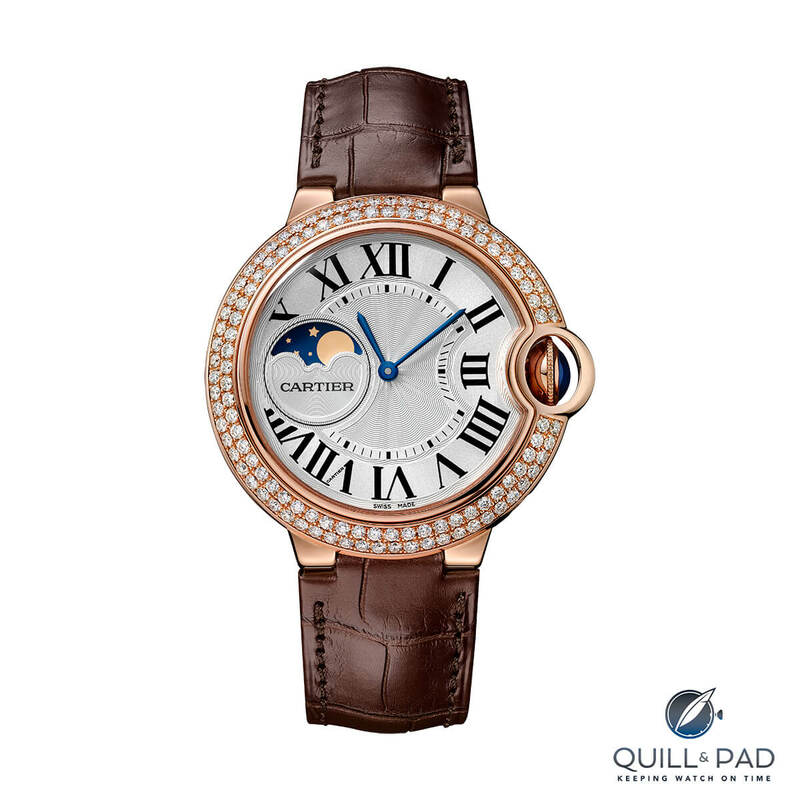 Cartier has usually favored displaying the moon phase in a more unique way. The calendar and perpetual calendar Pasha de Cartier models of the 1990s all had a moon phase in which it was the disk actually moving in front of the moon to display the current state. The same concept, but technically far more advanced, was used in the stunning Rotonde de Cartier Earth and Moon. When Cartier introduced an upgrade of the Rotonde de Cartier Jour et Nuit in 2014 (and a new version again in 2016) it equipped this watch with a moon phase. Since the entire bottom half of the dial was available to do so, the brand opted for a moon phase indicated by a retrograde hand. To come back to the original question as to why the moon phase has been largely absent from Cartier’s history, it is because it often did not suit Cartier’s design language. Given this history, you can understand my surprise when I laid eyes on the Ballon Bleu with a traditional moon phase positioned at 9 o’clock. At that moment I had no shame, took the presented watch, and immediately strapped it onto my wrist. The bezel features 1.47 carats’ worth of pavé-set, brilliant-cut, colorless diamonds, but I didn’t care. I also didn’t care that the watch was aimed at the female demographic. Hey, I have an x chromosome in my DNA like everyone else! I didn’t even care that the two fashionable press colleagues from Vogue present at the presentation raised an eyebrow to my actions; fashion always starts by somebody doing something for the first time! It’s no secret that the Ballon Bleu has been quite a success for Cartier. It not only pleased the existing customer base, it has also appealed to quite a few clients new to the brand with a collection ranging from the understated Ballon Bleu Extra Flat to the no-holds-barred Serti Vibrant (see Rods, Springs, And Palpitating Diamonds: The Ballon Bleu De Cartier Serti Vibrant). As it is a well-rounded watch (pun intended), the Ballon Bleu features a design that is quite suitable to incorporating a moon phase indication. This also becomes evident when you examine the care Cartier took to get this watch just right. The “canvas” is a 37 mm Ballon Bleu with an aperture at 9 o’clock for the moon phase: Cartier opted to display the state of this celestial body in the most classic way possible. At first it looks like part of the fringe holding the railroad track was cut out, but when you look closer you see that it actually continues around the moon phase indication the same way it does near the crown; only the hour and minute markers are really absent. Cartier also cleverly alternates the guilloche pattern on the dial, pulling the moon phase complication into the overall design of the watch, yet also subtly drawing attention to the complication. Unless you are an amateur astronomer, a moon phase complication is pretty useless. It’s like those beautiful, handmade copper pots in your kitchen: they look great, but you never use them. In a watch that is actually not a problem, but just like the makers of those handmade copper pots Cartier put a lot of effort in creating this moon phase module. I guess head watchmaker Carole Forestier-Kasapi and her team don’t get out of bed for anything less, but still the precision of the moon phase module is nothing less than impressive. A clever setup with seven teeth and star-shaped gears allows the moon phase disk to make one full rotation in 59 days and 90 minutes. Since that covers two full lunar periods, the accuracy per lunation is 29 days, 12 hours and 45 minutes, creating an error of only 57.2 seconds per lunation (11 minutes and 26.4 seconds a year). You probably won’t notice it, but please make sure to tell your grandchildren that they tell their grandchildren that a little over a hundred years from now, they need to reset the moon phase by one full day. Did I already mention that the moon phase is an actual module? One that sits on top of the movement? I have been told by Cartier that it not only fits on externally sourced calibers, but can also easily be adapted for use on Caliber 1904 MC and 1847 MC. That is very good news because, unlike me, you might not jump at the opportunity of putting a gold-encased, diamond-set 37 mm ladies’ watch on your wrist. However, if this was a gold or stainless steel Calibre de Cartier on a leather strap, it would would probably be a whole different ball game for you, and that might just be what Cartier has in store for us in the near future. For more information, please visit www.cartier.com/collections/watches/womens-watches/ballon-bleu-de-cartier.